Reminders were sent by email today to those members due to renew in August. If you don't recognise the link address for renewals in your email, it's because we use the email management system, MailChimp (at www.mailchimp.com) to send bulk emails. You can renew online by credit card at http://www.bordersfhs.org.uk/bfhsjoiningform.asp. If you can't or don't want to renew online please download the membership renewal form from http://www.bordersfhs.org.uk/Borders_FHS_Membership_Renewal_Form.pdf, with payment by cheque, credit card or standing order. If you're not currently a member and would like to join, please click on our Joining page. A 44 page magazine published 3 times a year. 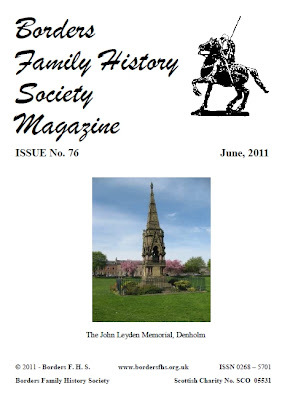 Each issue contains articles of interest to members, details of new members and their interests, and queries placed by members and non-members seeking help with their Borders ancestry. Discounts on the Society's Monumental Inscriptions volumes. Your queries included in the magazine (and, if you wish, on the website) free of charge. Discount on the Society's Research Service. Access to GEDCOM family trees by email free of charge. Discount on Scotland's People vouchers of 30 page credits. Normally £7 each, they can be bought from us at only £5.65 each, a 19% saving. 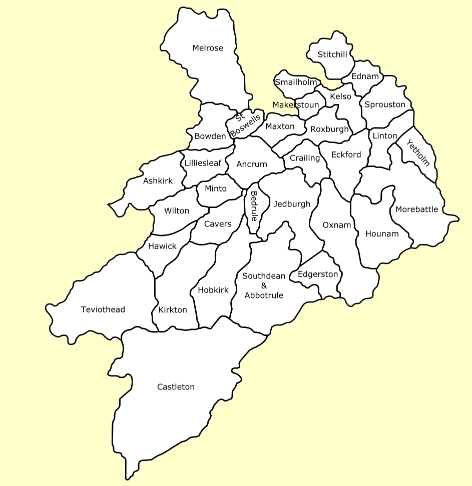 As you may have seen we’ve now added pages on our website for Roxburghshire, to complement the pages for Berwickshire, Peeblesshire and Selkirkshire. These pages were created by Ronald Morrison and David Rudram - a lot of work. Some of these pages include more detail than others so if you can contribute to one of the pages get in touch with us either via this blog or through the contact form on the web-site (you’ll need to scroll down the page to find it). Please let us know about any mistakes or if you find a broken link. They say that comparisons are odious. However a holiday in eastern England included visits to two local record offices which triggered some thoughts on the differences between them - and the Heritage Hub - and between English and Scottish records. First up was the Bedford Record Office housed in a late 20th century building in need of a bit of TLC. No formalities required when you sign in and they’re happy for you to use your camera provided you sign a simple copyright declaration. One of the differences between Scotland and England is that Parish Registers and all the other contents of the Parish Chest are deposited in the local record office. Bedfordshire parish records were transcribed by the county archivist many years ago and they are justifiably proud of the quality of the transcript. In fact they seemed quite offended when I asked to see the film of the original register. The Bedfordshire FHS has produced a county wide index of these transcripts - very useful for finding those intinerant relatives we all have. We moved onto the Norfolk Archive Centre, a very modern purpose built archive a couple of years older than the Heritage Hub in Hawick. Whilst you merely had to sign in to look at micro-form records, identification with an address was required before you would be given access to original documents. Norfolk is part of the CARN (County Archive Research Network) so that the ID they issue can be used at other record offices. They also charge for the privilege if you want to use your camera. I didn’t have a good day as I wanted to look at poor law records from the early 19th century prior to the Poor Law Act of 1834. The records of the Parish Overseer form part of the Parish Chest but nothing had survived for either of the parishes I was interested in. Digging around however I did find a whole series of militia lists in the private papers from Felbrigg Hall - I wonder if the Norfolk FHS knows about them? Leaving aside the fact that we’re stuck with the records from the places where our ancestors lived, do I have a preference ? Not really, there are good and bad features both nationally and locally. For example, Scots parish records have all been transcribed and images are available on the internet. English parish records always include marriages as well as banns (intimations) and deaths and beginning with marriages in 1754 were kept in pre-printed registers. The picture at the head of this blog comes from the Time & Tide Museum in Great Yarmouth. It’s located in an old herring smoke house and includes reference to the significant influence that Scots had on the herring fishery. The Bibliothèque Nationale (which is both the French national library and a museum) in Paris, France, announced on 6th July, that it was seeking partners for the digitisation and enhancement of its collections. Bruno Racine, the president of the Bibliothèque Nationale announced the historic step during a press conference in Paris. The Bibliothèque Nationale has identified 12 areas for which they are seeking partners, including books from 1470 to 1700, another collection of up to half a million French publications in the public domain, the French press from 1780 to 1940, 78 RPM records, medieval and modern manuscripts, photos and French films up to World War II. The Bibliothèque Nationale currently has a digital library, Gallica, that holds 1 ½ million documents, and this partnership programme is expected to more than triple its size. This is a very important announcement because eventually researchers will be able to view books online without having to travel to Paris. France was Scotland's ally during several wars with England, and the alliance (the Auld Alliance) dates back to a treaty between John Balliol and Philip IV of France in 1295, so many early books are particularly important for students of Scottish history. For more information about the Bibliothèque Nationale's announcement, read Le Monde's article in French or a Google translation in English. (First seen in the Anglo-Celtic Connections blog). There was a subscription school at Caddonfoot from about 1840. When the school boards were formed in 1872 they took over the running of the schools. A school board was elected in 1873 and they quickly organised a new school to be built which was completed in January 1875. The original Caddonfoot School Log book plus other documents relating to the parish at that time, can be viewed at the Hawick Heritage Hub. The school is due to close in early 2012, being replaced by a new school in Clovenfords and the pupils are undertaking a project to look at the history of Caddonfoot School through the decades. If you have any memories of this school, any old photos, or any other knowledge of any relevant history that you would be prepared to share with the children, please contact Megan Hill at megan.hill AT virgin.net, replacing the AT with the @ symbol. There's free access to digitised images of the 1930 United States Census on the Internet Archive. As these are just images, there's no search mechanism, though you could do a free search on Ancestry that will take you part of the way. The Internet Archive makes the images available by state, access the 1930 United States Census state collection, and select the set you want. More information on the 1930 United States Census and other United States censuses (1860 to 1920).